Note: This article was originally published in Technician on January 26, 2006. 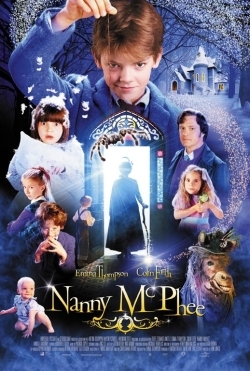 Nanny McPhee is not a movie for the average college student; however, in terms of kids' flicks, it's a fairly good film that most adults should at least find tolerable, if not entertaining. It has been 10 years since Emma Thompson's last venture into feature film writing (Sense and Sensibility), but if this adaptation of the Nurse Matilda book series is any indication, she still has a knack for it. Thompson stars as a snaggletoothed nanny who uses magic to teach a family of seven children how to behave. It's Mary Poppins for the Harry Potter generation, but luckily this film manages to distance itself enough from its predecessor to emerge as a unique movie that kids are sure to enjoy. This film has "fairy tale" written all over it. From a house with neon walls, to a dancing donkey, magic spells and Raleigh-esque weather, there are a variety of fantasy elements that serve to transport the viewer into a world that looks as if it came directly from the mind of a child. Thompson doesn't bother to explain the details of why certain things are how they are, and this will probably annoy the more mature viewers. But these vague intricacies won't be noticed by the film's intended audience -- children between the ages of five and ten. The acting is more than adequate for this type of movie. Thompson steals the show as the titular character -- her eerie demeanor and icy tone are further enhanced by her witch-like appearance. Angela Lansbury and Colin Firth also handle their parts admirably. As for the children, the performances are as good as one can expect these days from child actors. For a film focusing primarily on magic and mischief, there's a surprising amount of character depth and plot. Unfortunately, although the film is smart enough not to shove a "moral" down the audience's throat, the character-driven scenes often fall flat. With the exception of a few scenes, the drama feels either forgotten or overplayed to the point of being irritating. The plot drags for the first 15 minutes, but once Nanny McPhee enters the scene things improve greatly. While the magical escapades that follow probably won't appeal to many people over the age of 12, kids will most likely find them thoroughly enjoyable. There's a good balance between physical and spoken comedy, and this should keep most adults from falling asleep or finding the film completely boring. Most college students will not like this film. But it wasn't made for them. In a time when fairy tales have been forgotten and children are raised on MTV, Hollywood could and has done far worse for the new generation than Nanny McPhee.